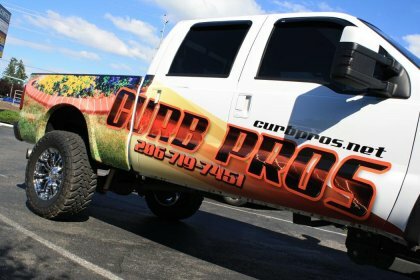 Truck graphics are what we would consider a "partial wrap" of your work or personal truck. It is a combination of lettering and graphics that delivers much of the same impact of a full wrap at a fraction of the cost. We use less labor and material to do a partial wrap and yet the colors, protection of the vinyl with high quality laminate and visual impact remain the same. Businesses that benefit from this type of partial wrap include small restaurants or start-up companies without the large amount of corporate capital needed to entirely wrap a fleet of vehicles. If the business just has one vehicle and they are trying to differentiate it from everything else that is on the road than this is the perfect solution. We can contour cut (or cut to the shape of the graphic) with our large plotting machine with exact precision. The color, placement and shape of your new graphics is important to get right because truck graphics are one of the best advertising tools around. 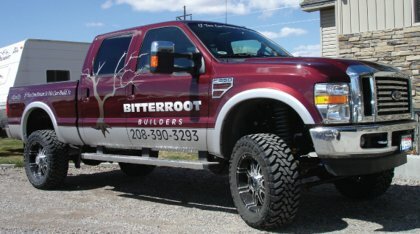 Along with truck lettering this is the way to get your business up and moving in a short amount of time. If you've ever given much thought to how much time you sit in traffic here in Denver or how long your truck is parked at a job site you can begin to see how much "face time" you are wasting by NOT putting truck graphics on your work vehicles. Every moment you spend on the road is an opportunity for you to make your customers aware of your services. We want to help you make every moment count.